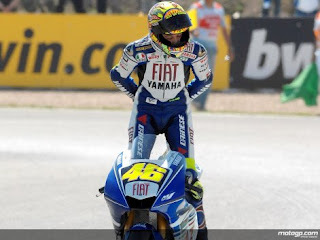 Tilted Horizons: Valentino Rossi Wins 2008 MotoGP Championship! 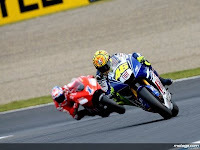 Valentino Rossi Wins 2008 MotoGP Championship! At the Japanese GP at Motegi on Saturday, September 27th, Valentino Rossi won his 6th premier-level (currently called MotoGP) championship, and 8th overall including the 125cc and 250cc classes. It only took 11 of the 24 laps for Rossi to advance to the lead from his 4th starting position and then win going away over his consistent chasers this season: Stoner, Pedrosa and Lorenzo. After finishing 2nd and 3rd the last 2 seasons, Rossi rode better than ever this season and won despite his Yamaha being down on power to the Ducatis and his team lacking the resources of the mighty factory Honda team. It's good to see the clown prince of motorcycle racing back in top post-race form, too. Rossi pulled over after taking the checkered flag, donned a t-shirt that had a picture of a watch at 8 o'clock and text reading "Sorry for being late" in Italian, then sat opposite a "businessman" at a hastily erected desk at the side of the track and autographed a helmet. Just another day at the office for "The Doctor" I guess. Turncoat! An Italian stomping Ducatis on a Yamaha! Where's the nationalism?